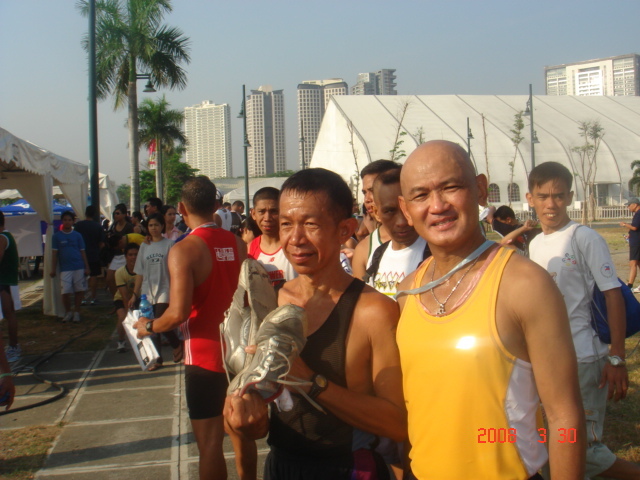 Instead of throwing away those “old, tattered, and worn-out” running shoes which were replaced with those slightly used donated shoes, the members of the Elite Team Bald Runner deemed it wise to wash and repair them to be donated (and recycled) to the garbage personnel or “scavengers” at the Payatas Garbage Dumpsite. So, after weeks of washing and repairing those old, tattered, and worn-out running shoes, we finally visited the Payatas Dumpsite this morning with Coach Titus Salazar and the personnel of the Philippine Army’s Civil-Military Operations (CMO) Battalion under the leadership of Colonel Buenaventura Pascual. At the Dumpsite, I was entertained by Jameel RM Jaymalin, Head of the Quezon City Controlled Disposal Facility (Official Name of the Payatas Dumpsite) and Payatas Operations Group, who is also a retired Colonel from the Philippine Army. He gave me a tour of the facility and assisted me in the distribution of the shoes to his personnel and the “scavengers”. The following are the pictures of the said activity. A Talk With The Representatives of the "Scavengers"
Even the PNP Personnel Was Included! Whatever You Read On My Shirt Is NOT True!!! 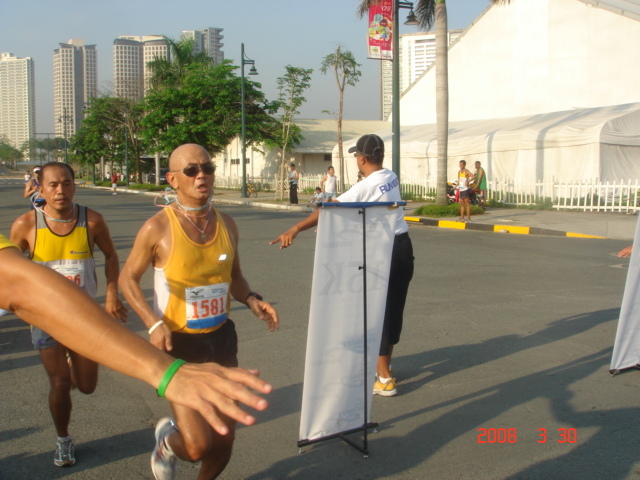 This concept or project of donating my old running but still reliable running shoes and encouraging others runners to donate their old shoes was born out from my observations of seeing young and senior runners participating in weekend road races, most especially in the 2008 Pasig River International Marathon last February 2008, who were seen with tattered and worn-out running shoes, walking and limping on the side of the road. So, I decided to post the pictures of my old running shoes to let the other runners know if they are in need of my old shoes or share the information to other runners and maybe, ultimately, make my offer reach to the needy ones. 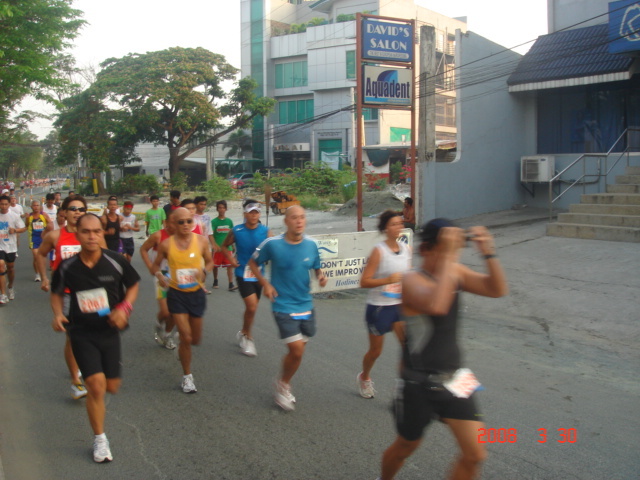 The comments of The Bull Runner, Banana Running, Quick Silver Runner, Mark, Cecil/Miraclecello, Benov, Datc, and others from that post inspired me to push through with this project through the help of my Officers & Staff of the DND-AFP Gintong Pangarap Running Club, Inc. And I am glad that this project was later endorsed by these bloggers in their respective posts. Three (3) of my old shoes were taken by three among the recipients. The remaining shoes (7 shoes) will be brought to the next road race next weekend for display/distribution to qualified recipients. Genevieve De La Pena got my Nike Air Max. 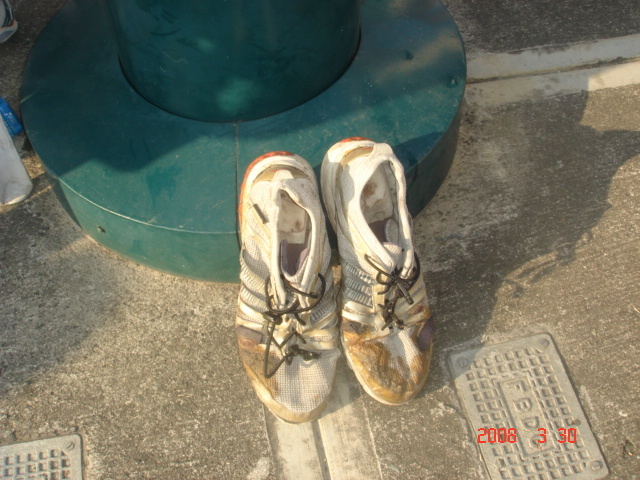 This is how a “tattered and worn-out” running shoes looks like which the owner exchanged with a better one after using it in the Mizuno 10K Run. This might be the lightest and most ventilated running shoe in the world whose owner does not even know the importance of support, stability, torsion control, and comfort that the latest running shoes provide to the legs and body. These are some of the donated shoes. 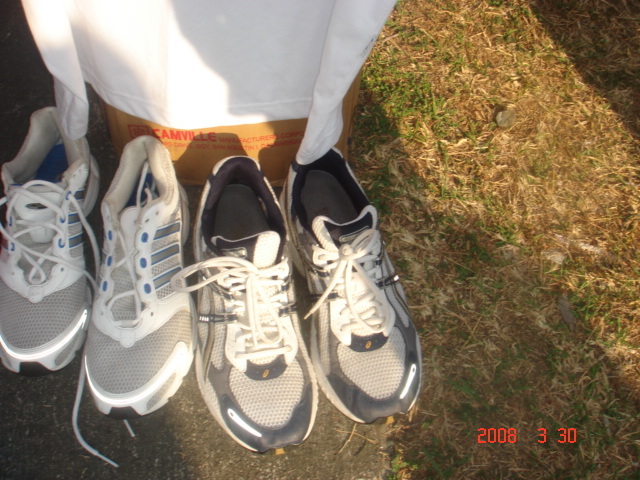 The ASICS GT-2110 at the right was the running shoes of Don Fernando Zobel. One of the recipients of the donated running shoes trying his size with his “new” running shoes. This project will continue as long as there are road races and we will make that our “Collection/Distribution” Booth will be a permanent fixture in all of the future road races in Metro Manila. To all the donors and “future” donors to this project, thank you very much! We wish you more blessings and successes in your life! I arrived at the Parking Area near the Assembly Area of the Mizuno Infinity Run at 5:10 AM and immediately had my stretching exercises and warm-up jogging. I saw to it that I had to drink water and force my urine to get out from my urinary tract system before going inside the check-in area. 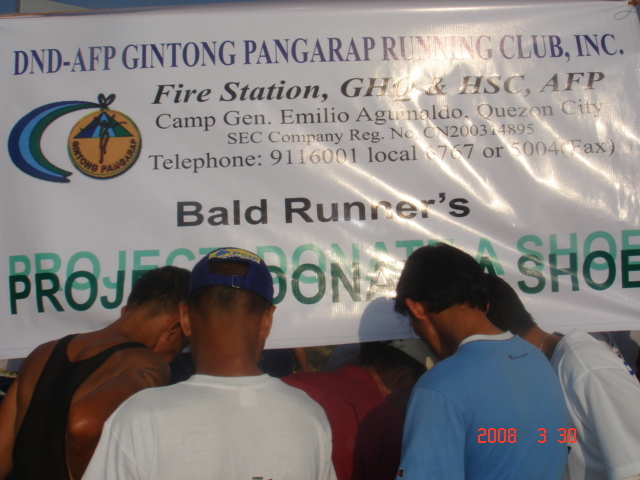 It took me about thirty minutes to warm-up while making sure that my officers from the DND-AFP Gintong Pangarap had arrived and put up their booth for the BaldRunner’s “Donate A Running Shoe” Project. I was glad that my staff had arrived on time and I gave them four of my old shoes for donation. Before the start and as soon as I entered the starting area, many runners had greeted me, most of whom are my visitors/readers of my blog. Guys, thanks for your comments and visits! 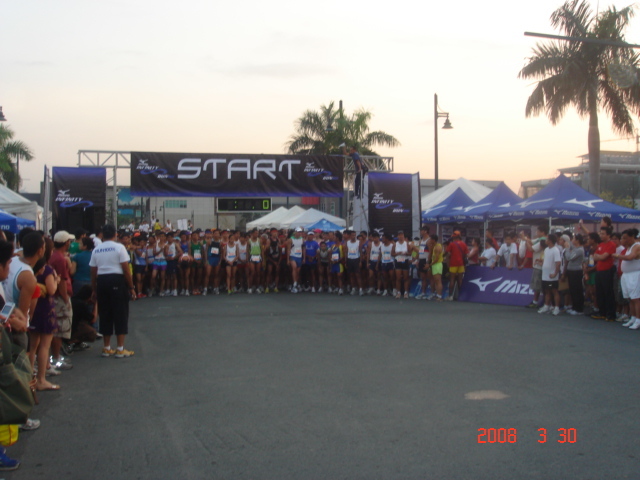 The 15K Run started at exactly 6:00 AM with the other runners in the 10K and 5K races to start after 15 minutes. The 5K was scheduled to start at 6:30 AM. As expected my 1st kilometer was a slow one, finishing in 5:44 minutes. But my time was a very slow pace from my planned time to finish every kilometer. I had to pick-up the pace when I was already at the Bayani Road. 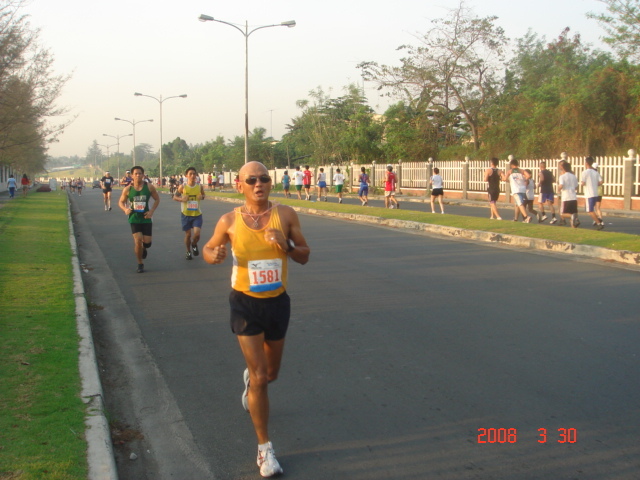 After almost two-kilometer run inside the Heritage Park, the hills before the Bayani Road, at Lawton Avenue, and at the McKinley Hill areas slowed down all the runners. 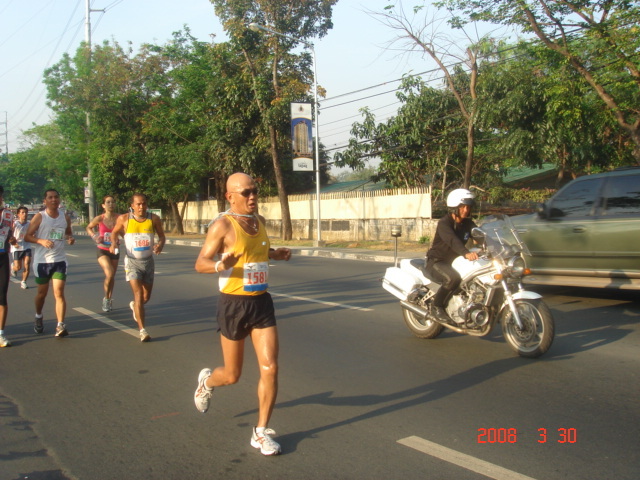 The worst was, once the runners reached Lawton Avenue after coming from Bayani Road, they were already facing the heat of the sun. 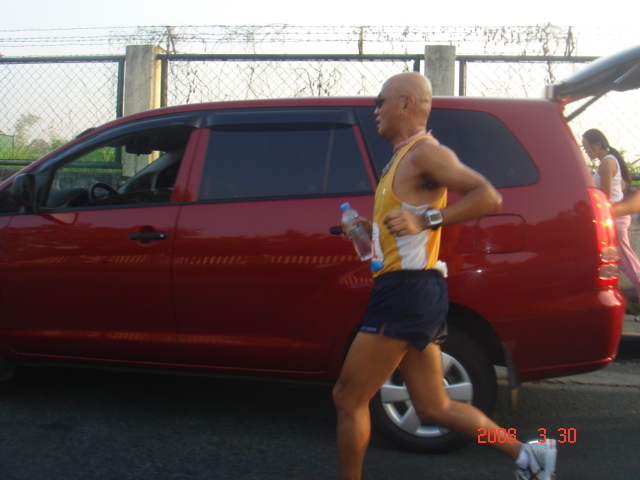 Running at 3-Km point along the Bayani Road before I threw water to the driver of a black Nissan Patrol who was about to cut us from an intersection. I met Mark at this point after the said incident. 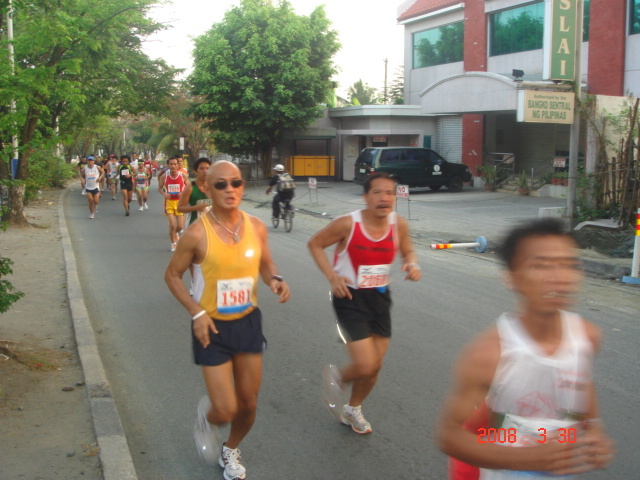 It is fun to run when there are lots of runners around you, the more you have to increase your pace! At this point, going to Km. 8, I just left the Heritage Park and about to run uphill towards Gate 3 of Fort Bonifacio. I started to pick up again my pace after successfully ascending from the McKinley Hill area and reached back to Lawton Avenue. At this point, I had only 2 kilometers to go before the finish line. 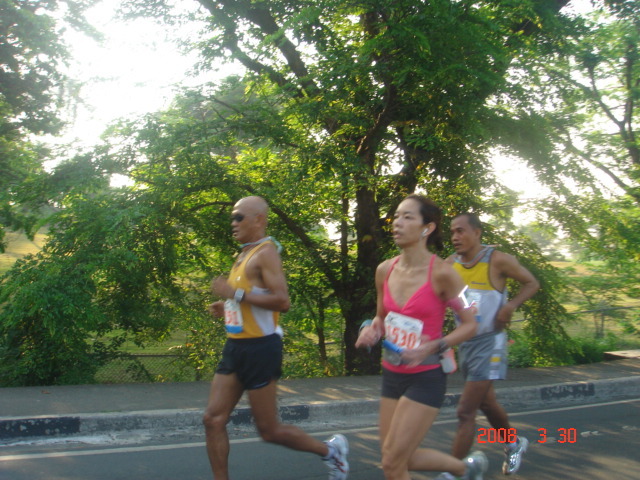 I joined the pace of a lady runner in pink and a soldier from Camp Aguinaldo. At the last turn before the Finish Line, I saw the digital clock registered 1:16:00 hours. I just maintained a quick pace and was able to cross the finish line in 1:16:27 hours, my unofficial finish time for the 15K race. I picked-up my pace after leaving McKinley Hill area. The motorbike rider who escorted me from Heritage Park to the Finish Line was one of my personal drivers & member of my security detail when I was then the Camp Commander of Fort Bonifacio. A picture with the lady runner in pink who set the pace along Lawton Avenue and a soldier from GHQ, Camp Aguinaldo following us. This was the first time I saw this lady in a weekend race. She is strong and I am sure she placed one of the top five among the ladies. At the finish line with a time of 1:16:27 hours as I read from the digital timer/clock, my unofficial finish time. After finishing the race, I immediately went to the booth where my staff established my Project “Donate A Shoe”. I found out that three of my old running shoes were already given to the less fortunate runners. Later, Don Fernando Zobel of Ayala Land Inc. approached the booth and asked where he can donate his shoes. And I and my staff answered, “Here, sir!”. 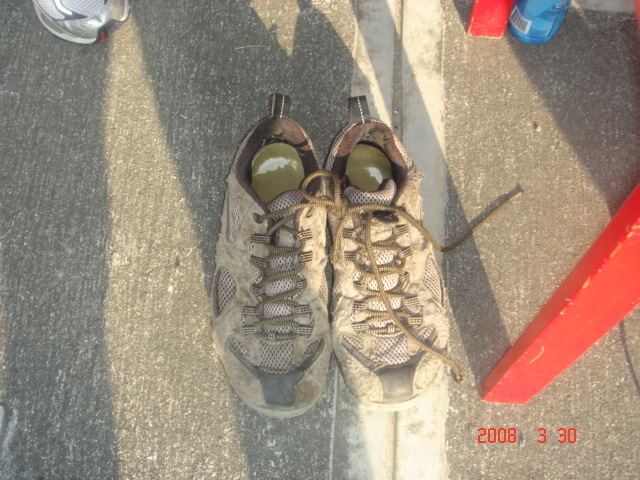 He immediately removed the running shoes he was wearing, an ASICS GT-2110, and donated them to us. We let him signed some forms and took some pictures of him and myself. He left our booth walking with only his socks on. Thanks, Don Fernando! We salute you! 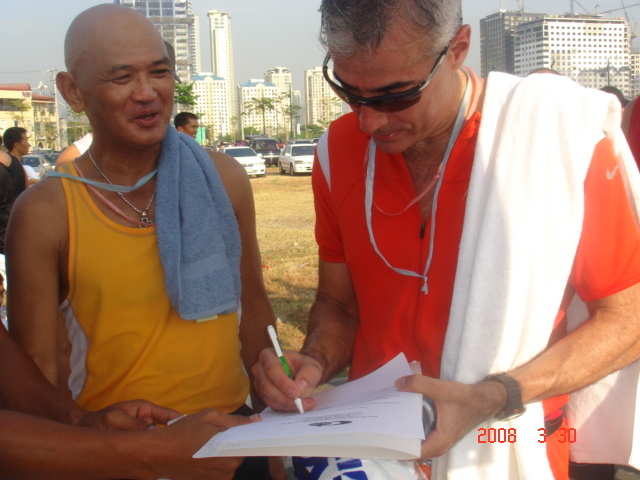 Runners looking at the array of donated shoes infront of Bald Runner’s Project “Donate A Shoe” booth being supervised by Major Rod Turno and Capt Ferdie Espejo of the DND-AFP Gintong Pangarap Running Club, Inc.
Don Fernando Zobel signing the Deed of Donation for his running shoes he was wearing that he donated. I gave him a “ONE” Wristband which he accepted. Many of my officers/enlisted personnel and dependents in the Philippine Army, my brother, members of the Happy Feet Runners Club, Fairview Running Club, Takie, Mark, Jomes, the BullRunner, jhun & wife, rene & doc from Gold’s Gym and others whom I forgot their names approached our “booth” and had good words about our project. We had some picture-taking, too! 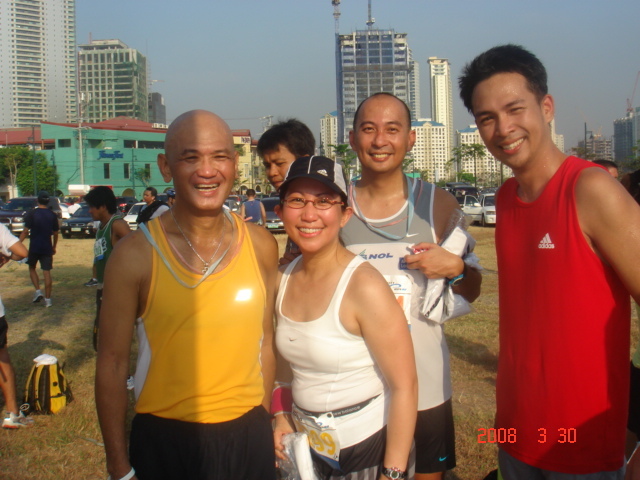 A pose with the members of the Happy Feet Running Club. Guys, you look great! A pose with my brother & wife who joined the 5K run. 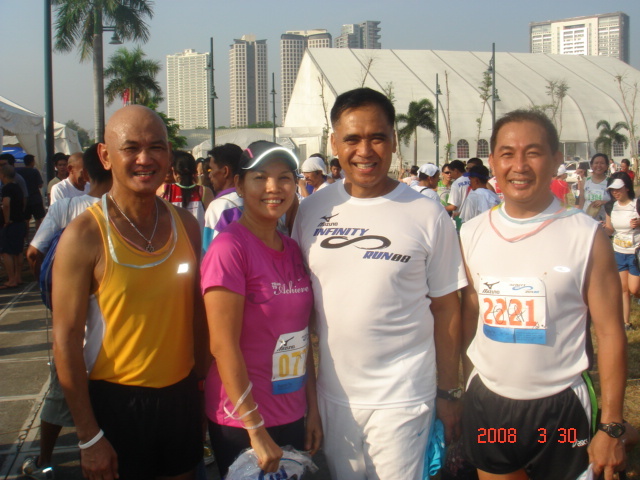 At far right is Colonel Oscar Lopez of the Philippine Army who is also a passionate long distance runner & joined/finished the 15K run in sub-1:30:00 hours. A pose with Takie and the most popular The Bull Runner among the Running Bloggers! One of the senior runners who received my New Balance 902 Performance Running Shoes showing his old shoes which he used in the 15K run!